Last Sunday we went to Blackpool to meet up with Dave McGrath (@DaveyManMcG) to do some rock pooling which was really fascinating and great fun. The traffic was chaos and we only just made it in time as we arrived at the wrong end of the prom and had to drive right down the promenade dodging trams, horses and carts and thousands of people. We met up with Dave at the Solaris Centre and had a quick tour of where he does his pond dipping and then we got to meet one of the starts of the day, Dave's friendly dog Frank. Of course we were with quite a few other people and it was great to see other children taking a shine to nature in this way. We started off with all the safety rules, however after that we were free to do what we wanted and to find what we could. We were rockpooling just in front of the giant mirror ball. The water in a lot of the pools was crystal clear which let us see some great anemones opened up. There were one or two jelly fish about including this one below. It was great to have expert Dave on hand to help identify everything we found including shore crabs, Blennies, Prawns, Shrimps, Masked Crab, Spiny Cockle, Otter Shells and all sorts of wonderful creatures, and some that I have never seen before. I learnt about the Masked Crabs that you might feel tickling your feet with their long spiky tongue if you stand still on the wet sand. Of course I had to look out for the birds, plenty of Oystercatcher and a couple of Turnstones (that Dave said had only recently arrived). I thought wearing wellies would keep my feet dry however that didn't really work out as planned. They don't protect you that well when you're crawling through the rock pools. Should have taken my watch off as well! Of course a big thank you to Dave (and Frank) for inviting me and letting me have such a great opportunity to discover nature in a completely different environment. I'm hoping to go Long Eared Owl spotting with Dave again soon and of course he has to come and see the birds on my patch. After weeks of travelling round and being really busy it was great to enjoy some pure birding on my ,local patch. As you know I have a feeding station in a farmers wood, which attracts all kinds off birds, but the fields and pastures on the way there attract a few different migrants. As I was walking down the track yesterday I saw the white flash, and this was indeed the rump of what I think is a first winter Wheatear, a lovely bird which I have seen only rarely on my patch before. I was able to get a few nice snaps before it was off, however I had to check the books on the identification because it's hunched body shape and "fat" neck made me a bit curious of a possible Wheatear rarity. So a great little bird to go on my BTO bird track report, oh and also got great views of a Green Woodpecker (a first for my feeding station area). My next post will be more coastal! Birdfair, my annual birding "holiday", it is the place where all conservationists come together to share ideas and to inspire. Everything is fantastic. Last year we only made it for two days, however this time we decided to do all three, like always our birdfair adventure started a bit slow. Yep, you guessed it, busy traffic almost the whole way and we were stationery for over half an hour, but this was one of the reasons we came on the Thursday so we wouldn't miss half of the actual event. Like last year we were staying in Scalford Hall Hotel, which is located in some gorgeous countryside which is home to Tawny, Barn and Little Owls. Now last year I was at the A Focus on Nature and BTO conference in Norfolk at the BTO Headquarters, and met up with some other passionate wildlife enthusiasts, and staying with us this year were Josie Hewitt and her mum Alison. It was lovely to see them again and they were also pretty excited about staying all three days. As well as meeting Josie, it was also lovely to catch up again with Joyce a lovely lady that works at the hotel who reads my blog and is very supportive. Josie, Harley and I went looking for the owls and were very lucky to see and hear Tawny Owls. Of course after a good sleep it was time for the first day of Bird fair. Now bird fair is supposed to be all inspiring, relaxing, learning and fun, however this time we had to bring a 6 foot Hen Harrier with us, in a hired van with only 20 minutes to get it into the fair and on to the correct stand. Of course firstly it took a bit of persuading of security to get it in however after a bit of sweet talk we were escorted to the correct stand, the Wildlife Crime Unit which is all to do with illegal persecution of wildlife, especially raptors. Once our Hen Harrier was settled with the wildlife crime police, we were free to enjoy the fair. On the Friday we didn't do much except listen to Mark Avery and Tristan Reid's talk which was all about the extinction of the Passenger Pigeon and it's relevance today, and how the Turtle Dove could disappear if we don't take action now (of course no one noticed Mark Avery mentioning his new book)!! Now the reason we didn't do much on the Friday was mostly because I was very sick so unfortunately we had to go back to the hotel at about 11:00am, so I was pretty down and I missed talks from Andy Clements and Ieuan Evans. I managed a quick hello to Toby Carter before I had to rush away. I was also really pleased to see Keith and Trevor as well, as they were only there on the Friday. Fortunately I still had the rest of bird fair left to look forward too (by the way thanks for all the support on Twitter and thanks for all the Harry selfies that started appearing on Friday). After being sick, I was glad to be back at the bird fair on Saturday, luckily most of our talks were on the Saturday, but mainly in the morning. This left all afternoon to meet up with people and look around all the wonderful stands. It was great to see so many more younger people there this year, especially at the Focus on Nature meeting on Saturday afternoon. However firstly about the talks, we started off watching and listening to Guy Shorrocks. This talk was great and fascinating in a sad, but making you realise properly way. This talk was all to do with Raptor Persecution and the work he does on stopping the illegal killings. 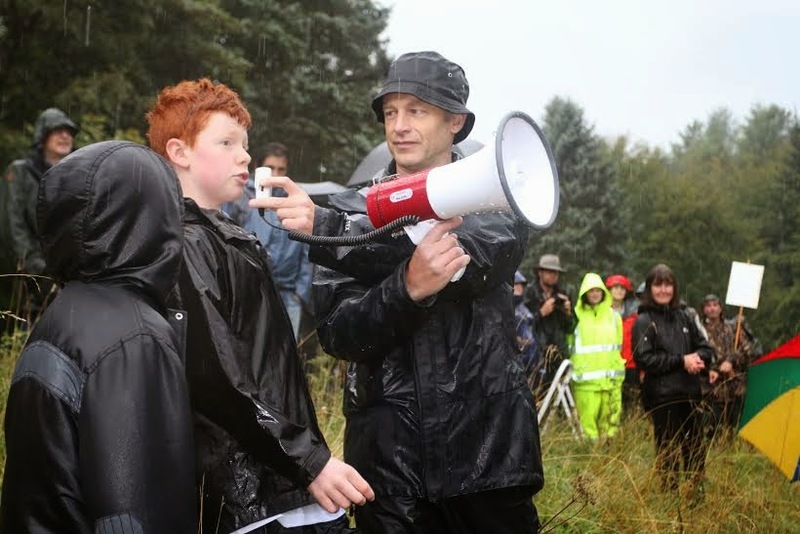 It was really interesting and Guy also turned up at the Hen Harrier Protest. Our second talk was in a building (not part of the tent set up) which was being used this time by Jack Perks. It was his first bird fair and he spoke really well. Jack was talking all about fish and his mission on filming all the freshwater fish in the UK; out of the I think 53 species Jack was on 38, so was doing pretty well. All these talks I went to have made me really want to talk at the birdfair next year. I would really like to talk about what it means to be a young conservationist and all the ways us youngsters can help to make a positive difference. I will have to try and ask Tim Appleton if this would be possible. We were going to listen to Mark Avery's and Chris Packham's talk, however by the time we got there the tent was full, however I couldn't help but wait to say hello to Chris (after meeting him at the Hen Harrier Protest) who was pretty inspiring with his "we will win" attitude. At the end of the talk I bought Mark Avery's book "A Message from Martha" on Passenger Pigeons. It was also lovely to say hello again to Mark and explain to him why I didn't see him on Friday because of course I was sick. That left the rest of the afternoon to have a look around the stand and meet lots of new and familiar faces. I've got to say probably the most frequent collisions were with Jason (Wildlife Gadget Man) off twitter, he's a great man with lots of technical support and knowledge to share, also I met Toby Carter round every corner. 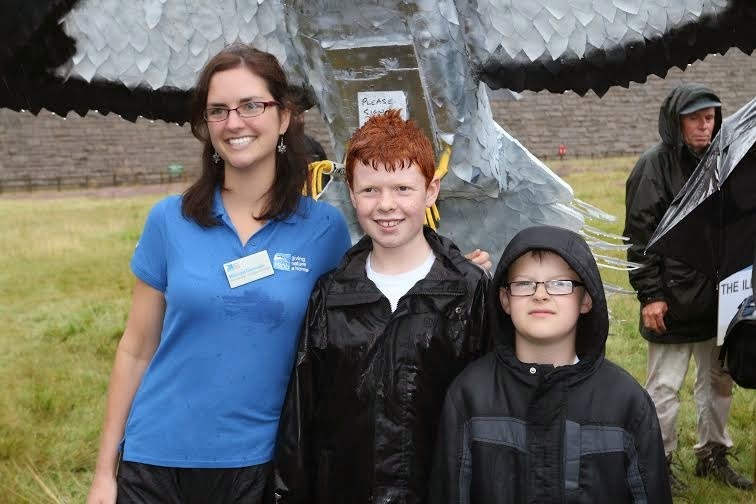 Toby is another young birder and I met him the at the A Focus On Nature conference. Of course, as usual I just had to keep visiting the BTO stand, it was great to see Andy Clements, Nick Morgan, Jez Blackburn, Lee, Carl Barimore (gave me the nest challenge, got seven out of eight which was reasonable) Dawn Balmer, Ieuan Evans and of course Kelvin Jones (also great to see again after ringing Choughs). After I'd met everyone and talked for ages, it was time to look around. The first tent we went in we met my Turkish friend from last year, and the year before that, who was lovely. Of course there were lots of holidays for sale, but I didn't manage to get a free one. I also met some great people on the Hawk & Owl Trust stand and on the Butterfly Conservation stand. It was good to see Dr Robert Sheldon and of course Phil Gatley again as well. Now I did actually have one more talk left to go to; a talk by Lucy McRoberts on why children should engage with nature and how important nature is in everything we do. Lucy talks really well. After a tiring day it was time to go back, however before I went to bed I got into a chat with a guy called James who does conservation work and lives in Honduras in Central America. He had some 700 species of butterfly and 700 species of bird all out of his window, it was fascinating; however the most astonishing thing was that in the rain forest he had Barn Owls like we have here. Also at the hotel we met some of the Hookpod people who have made a specially designed fishing hook which stop Albatross getting drowned, these people were very nice and fascinating to talk to. The final people who were at the hotel were some of the people from the BioTope stand which are a group like the RSPB, but in Norway, they gave me a T-shirt. After the Saturday it was Sunday (obviously). It was great with only one talk on Dragonflies that was fascinating. The guy was lovely and would like me to go to the society meeting in London. After that it was just looking round the stands again and it was great to meet up with Geogia Locock who writes a brilliant blog and recently got some great Otter footage. As I mentioned right at the start of this blog post, we were really happy to have Harry the Hen Harrier with us at Birdfair. He stood tall and proud all weekend reminding people just how amazing this species is and what a big gap there would be if we lost them from England forever. I have seen so many Harry selfies on Twitter, the response to him has been amazing. And then it was time to finally say goodbye to Harry, which was actually really hard. We have been on such a journey with him and met so many amazing people through him. I am really going to miss Harry, but hopefully he will keep spreading the word and raising awareness for our amazing Hen Harriers with the RSPB. A great birdfair with great people full of great ideas. After all the on-line communicating and talk of Hen Harrier Day, it finally came round. The event I attended was located at the North Peak District, however the same sort of thing was happening at Northumberland and Forest of Bowland (you can read about the Bowland event on David McGrath's brilliant blog). The scenery on the journey to the Peak District was just great, especially when we entered the moors. We left the house at around 5:30am, and arrived just before 7:00am. The day had already started well as I saw six beautiful Red Grouse on the way. Mark Avery (the organiser) had already arrived with a couple of other people, and was amused to see that I had managed to bring our 6ft Hen Harrier (with the help of dad and dad's van). I had already started to meet new faces and get chatting, when suddenly out of the blue came a male Goshawk. It settled in a Sycamore just in front of me. Another great sighting and it wasn't even 7:30am yet! By now a few more people had started to arrive so me and my dad (the whole family did attend this event) decided to take the Hen Harrier (Harry) and his stand down ready to where the photo was going to be taken by the dam later in the morning. Now for those of you who don't know, the actual event was to raise awareness for the Hen Harrier as this species is currently being persecuted i.e illegal trapping, poisoning and shooting, with only three pairs in England breeding this year and scientists saying the suited habitat could home at least 300 pairs, so we all need to do something about it. If you've never seen one before, go and find one (and watch it's acrobatics as it skims, soars and dives across the purple heather) and then you'll understand just how bad it would be to lose them forever. When we eventually got the Harrier down to the dam wall we had to screw the stand together, then get the bird actually connected to it, which I've got to say is much more easily said than done. Before we headed back to the car park I thought it would be great to get people to sign the post of the stand and again show how much support there is for our Hen Harriers. Dad's work pens came in useful. And furthermore I have thought about leaving the signed stand (and maybe Harry) outside the house of my local MP (Stephen O'Brien) to see what he makes of our efforts. Now if you didn't know I hadn't made the Hen Harrier for the day, it was actually made for a village scarecrow competition to try and raise awareness for the Harrier aimed the citizens of Moulton, however when I heard about Hen Harrier day a couple of weeks back we all decided to take along Harry, and I think it was the right decision as he seemed to keep everyone together in a big group after the talks were over. The money I won for the scarecrow competition I donated to RSPB Sky dancer who I met up with and gave the money to at Hen Harrier Day. The lovely person collecting it was called Blanaid Denman and we had a great talk about Hen Harriers, Mark Avery, the event , all the people and how far they had traveled and of course the rain! After the first couple of photographs and greetings, lots of people had started to arrived and I was able to get a chat in with Chris Packham who was also there supporting the Hen Harriers; it was really nice to meet him again and I told him to look out for Harry down by the dam. It was great to meet the likes of Andre Farrah, Alan Davies, the Hawk & Owl Trust, various Wildlife Trusts and lots of other people, and overall, from my point of view, it looked like a great turn out with all the people, film crews, media and even just normal people not aware of the event joined in. When Ten O'clock came round Mark Avery gathered everyone round for the picture and speech. The first speech was a few words from Mark thanking everyone for turning up in the not so ideal weather conditions, he said it he hadn't done that much to organise the event but that isn't true. Anyone could tell that a lot of hard work, care and passion had gone into the event. Mark then passed over to Chris Packham, he started off saying a few words, however suddenly he started talking about a big bird behind the crowd. I thought "hmmmmm that's my Harry" and a few seconds later he called my name out, I was so shocked. After a round of applause for Harry, Chris himself started asking me some questions and passed me the loud hailer. I talked about what I felt about Hen Harriers and how and why I made Harry. I've got to say at first I was a little nervous talking in front of the 570 people that turned up, but at the end when I had finished I felt like my voice had been heard and that I could help to make a difference. Now of course I was listening to Chris's speech like a hawk (or maybe a Harrier) but one thing he said stood out to me that I had never heard anyone admit to before. "Conservation organisations and people had failed"; now that stood out to me because I am a young keen conservationist. I knew that what he had just said meant something because it did make people pay more attention, and made me feel that we all need to work harder for the Hen Harriers (and other species), but as Chris said at the end eventually "we will win". At the end of the speeches everyone dashed back over to the Hen Harrier and I had a couple of pictures taken with Mark and Chris, the Wildlife Trust and a few other people; I found everyone there inspiring in some way and loved meeting everyone trying to make a difference. One of the other people I wanted to meet was an MP, the Shadow Environment Minister, Barry Gardiner, it was an absolute pleasure to meet him, and was really interesting to find out his point of view on Hen Harriers and of course overall conservation. He said the same thing as Chris and Mark "you are the younger generation of wildlife protectors and will do well" which encourages me to keep trying but also reminds me to appreciate people's support and to take in to consideration different points of view, even if I think they are wrong. One the journey home all the rain had created amazing waterfalls across the Peak District and the clouds were still clinging to the tops of the hills. I imagined seeing a Hen Harrier coming tumbling out of the cloud and skimming across the moor, calling out to it's mate. In a few years maybe I wont just have to imagine this, maybe we will have made a difference, maybe we will have won. I am going to finish this blog post off with a list of all about 250 people who signed Harry's perch. I wanted to say a massive thank you to them for caring and think they all deserve a mention. I might not get all the spellings and messages right as the rain and some dodgy hand writing on a post don't go very well together. And finally, again a massive thank you to Mark Avery and Chris Packham. See you all at Birdfair. Cornwall, a place of stunning natural beauty, the beaches, scenery, everything about the county is wonderful, especially the wildlife. Now every year we have a family holiday, it's all about going to the beaches, body boarding, crabbing, swimming and being relaxed and away from school work, however I just couldn't keep away from the moors near where we were staying and all that wonderful wildlife. We were staying in a little village called Portreath, just off the A30. We had a stunning view of the sea front, and all the wildlife passing across; seeing Arctic Terns, Common Terns (and a possible Sandwich Tern), Kittiwakes, Fulmars, and lots of Gannets with their young, and all this was in the first hour of arriving and from the decking area where we were staying! Over the moors we saw lots of birds of prey including this Buzzard with the rest of it's family. However a few seconds after scanning the cliff face, a female Merlin came from no where and zipped through the sky straight across us which was brilliant. I just stood staring and never even thought to take a picture, but sometimes it is just about watching and enjoying the moment. Now where we were on the moors there were plenty of butterflies; Dark Green Fritillaries, a solitary Silver Washed as well. Plenty of them, but suddenly out of the blue came this large bright yellow butterfly, almost instantly I new what it was, but I was still in shock after never seeing one before. It seemed to fill the whole sky it was so bright. This butterfly was the Clouded Yellow, an Immigrant to the UK, first originating from North Africa and Southern Europe. On the way to one of the birding sites I wanted to visit, we stopped off at a place called Hell's Mouth. This place was brilliant, especially for seeing a family of Fulmars, circulating the sea and landing on the cliff face about 10 meters away from us. There were even some still fluffy chicks to enjoy. Also at Hell's Mouth we saw a young Kestrel experimenting on the cliffs flying from perch to perch and some unusual behavior of it gripping onto the grass then spiraling down, then twisting back up again, a wonderful sight. There were plenty of moths around as well, including this type of Eggar, not sure which sort though (please could someone help identify it). These kept hurtling around in the daytime, knocking into us even though I tried to dodge them. They were fascinating up close, but quite a few had been pecked by creature further up the food chain. Also in the gorse alongside the cliff face, was a family of what look like Rock Pipits, all learning and adventuring together. It was the first time I had seen them in Cornwall. And of course the wonderful Stonechats (which I know Pete Woodruff will like), the moorland specialists, a whole family of six followed us around the area of the moor, letting us get really close (adult Male below). Here's one of the young one's which allowed me to get really close. This specific place was also really good for mice and rodents, and saw this dead shrew on the way back from my moorland walk. On our final day of the holiday I visited the RSPB Hayle Estuary which a nice lady of twitter called Mary Jasper recommended. This was an amazing place, seeing Med Gulls, Common Sandpipers, Little Egrets, about 80 Curlew and a solitary Whimbrel. This place was also brilliant for dragonflies, however I was a bit disappointed only saw one (which was a Broad Bodied Chaser) zipping up and down across a shallow pool. We spent our last day in Cornwall up on the cliffs with an amazing abundance of wildlife. And as the sun set on our last night, I started to think about Hen Harrier Day coming up this Sunday (10th August) and how important it is that things change for the better. So please have a go and put a comment on with your answer. I will post all the answers tomorrow night along with all the guesses.